Mormon Mommy Writers and Friends: It's Heeerrreee!!! That's right! MMW is proud to announce the birth of our second book baby! 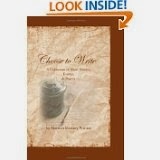 Choose to Write: A Collection of Short Stories, Essays, and Poetry is now available to purchase in paperback!! You can buy it a this link. You can also find it on Amazon!! Choose to Write is a collection of stories, essays, and poems that are all about being a Mormon, or a mommy, or a writer. These common threads cross the lines of diversity and link each piece together into a patchwork of unity. This unique collection shows how Mormon Mommy Writers, like many other blogging communities, can use our individuality to stitch together a book that evokes suspense, humor, spirituality, and above all else, love. Inside this wonderful book, you will find the winning stories, essays, and poems from the last MMW writing contest, an editor's choice, and some pieces written by some of our very own MMW bloggers. Be sure to get your copy today and read stirring essays about motherhood, and the priesthood, read poetry that have you smiling and leave you inspired, and enjoy stories about many things including an author who's dead characters come back to haunt him!! It is truly a book we are proud to present to this community and can't wait for you all to read it!! The ebook is coming soon!! Very cool! I'm excited to read it! Got my copy. :-) Thanks for the opportunity to enter the contest and win. I'll be writing a bit about this in my next post. And yes, Nikki, I know it was a lot of work! Thank you!